Krispy Kreme has created a doughnut empire by producing the same hot, fresh, and familiar doughnuts for 75 years. Their branding is built on that sense of tradition and customers take comfort in the fact that these iconic doughnuts haven’t changed with the trends or the times. Ironically, the brand’s insistence on staying simple and the same completely contradicts with contemporary wisdom that brands must continually evolve to stay relevant to modern audiences. Despite this attitude toward constant change, Krispy Kreme has sustained its success by bucking that trend and staying loyal to the ways that have always worked for the brand. QSRMagazine.com reported on how the doughnut dynasty has succeeded by feeding the need for the tradition and comfort that customers crave. At Krispy Kreme, the dough mix for the doughnuts has been blended for 67 years on a great deal of the original equipment in the same plant in Winston-Salem, North Carolina. The menu has remained focused on the same hot and fresh doughnuts rather than drifting to other popular items as other chains have done. The brand understands that its customers want doughnuts and not trends. They also realize that the doughnuts may feed their hunger, but the experience itself fulfills an emotional need and has created long-lasting bonds with millions of loyal customers. While Krispy Kreme is known worldwide for its original glazed doughnut, the brand doesn’t want its customers to get bored so they have developed approximately 300 doughnut varieties over the years that are available at various times. The glazed doughnut has remained the top seller, but customers appreciate having the option to try a slight twist on their favorite. While this may be perceived as a nod to evolution, the brand simply views these flavors as providing more ways for customers to enjoy a classic favorite while staying true to their brand identity. In fact, Krispy Kreme learned that changing with the times could actually hurt its identity when the brand introduced a whole-wheat doughnut in 2007 to please more health-conscious customers. Very few sold because the healthier doughnut went completely against Krispy Kreme’s image of gratifying indulgence. It was quickly discontinued. In an effort to make it more convenient for people to enjoy their Krispy Kremes, the brand has made licensing agreements into a central component of their business model. Today, the doughnuts are sold in branded retail stores, as well as supermarkets, gas stations, and convenience stores. 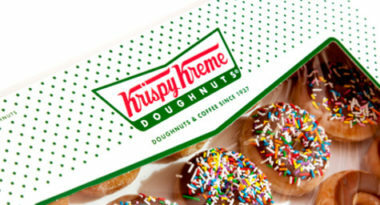 While this mass distribution made it easier for fans to fulfill their cravings, experts believed that such broad distribution was a mistake since it took away from the brand’s reputation for the hot, fresh doughnuts that made them famous. These additional locations are only able to stock the pre-made doughnuts rather than make them fresh, so they cannot offer the full Krispy Kreme experience. As a result, these outlets have started making their own doughnuts to compete for market share with the popular brand. While loyalty often wins out, these competitors are making a real dent in the market with their fresher offerings. Still, the brand ultimately wanted to grow beyond its Southeastern roots and set out toward national expansion in the 1990s with great success. In April 2000, Krispy Kreme debuted on the New York Stock Exchange to even greater success, which led to a flock of franchises opening nationwide very quickly. Such rapid expansion became the brand’s downfall when the market became oversaturated with Krispy Kreme shops and their stock fell dramatically. By 2004, many had closed their franchises and a scandal involving the company’s accounting in 2009 marked a dark time in the brand’s history. In the face of such national struggles, Krispy Kreme ventured into the international market and found huge success. Currently, the brand has more than 450 stores internationally, which is almost twice as many as its 250 stores in the U.S. By 2017, Krispy Kreme plans to have 900 international locations. As further proof of their comeback, the company recently celebrated its 14th quarter of same-store sales growth. Interestly, brand executives are pleased that their competitors have found success by expanding their menus beyond doughnuts into items such as coffee, sandwiches, and smoothies. This means that Krispy Kreme can retain its reputation as the king of doughnuts and stand as a haven for hungry people craving doughnuts from the brand that specializes in them. To celebrate 75 years of this doughnut dynasty, Krispy Kreme held a giant party at its Winston-Salem headquarters in July featuring free glazed doughnuts, live music, games, and rides for fans. More than just doughnuts, Krispy Kreme has become a brand based on memories and one of the few that can still be trusted to offer a taste of tradition. To learn how brand loyalty can increase your company’s appeal to consumers, contact MDG Advertising today at 561-338-7797 or visit mdgadvertising.com. MDG Advertising, a full-service Florida advertising firm with offices in Boca Raton and New York, NY, specializes in developing targeted Internet marketing solutions, exceptional creative executions and solid branding and media buying strategies that give clients a competitive advantage. Our core capabilities include brand development, creative, digital marketing, print advertising, media planning and buying, TV and radio, public relations, Web design and development, email marketing, social media marketing and SEO.